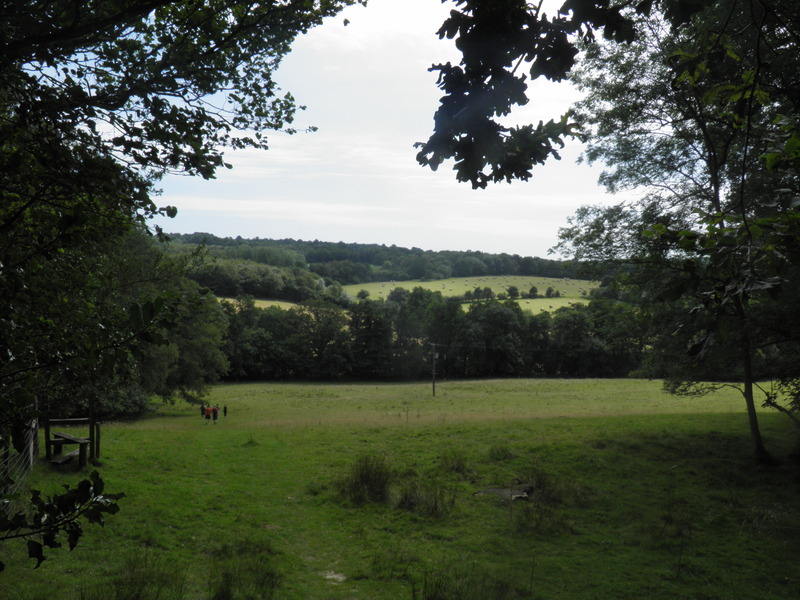 A fine walk through the Kent/Sussex borders, linking the lush Medway valley, moated Groombridge Place, the evolving habitats of Broadwater Warren nature reserve, sandstone outcrops and the sweeping sheep-grazed Eridge Park. 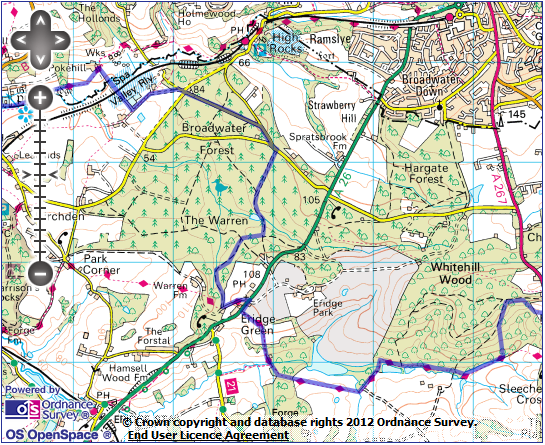 Underfoot: Generally well-drained field paths, firm tracks and minor roads, though some of the paths, particularly in the Grom valley, will be muddy after any rain. A couple of stretches are prone to stinging nettles, so long trousers may be sensible. Terrain: Occasional short, steep climbs, with rolling terrain throughout. Maps: 1:50,000 Landranger 188 Maidstone & Royal Tunbridge Wells; 1:25,000 Explorer 135 Ashdown Forest and 136 High Weald & Royal Tunbridge Wells. Getting there: Ashurst is situated on the branch line to Uckfield. Monday-Saturday, Southern operate one train per hour from London Bridge (49 mins) via East Croydon (34 mins) for connections from London Victoria. On Sundays, there is an hourly shuttle service to Ashurst from Oxted (21 mins), where they connect with a service from London Victoria, via East Croydon for connections from London Bridge and London St Pancras. 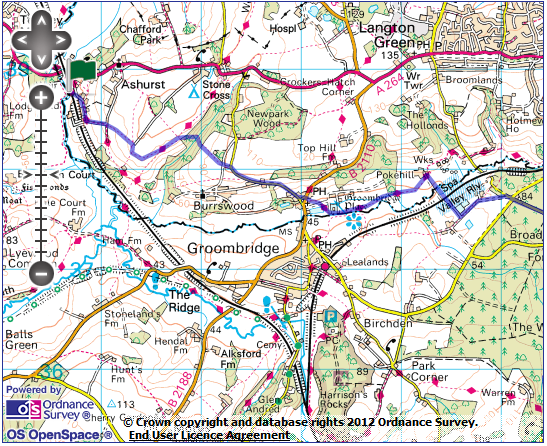 Useful websites: The route passes the gardens of Groombridge Place and crosses the steam Spa Valley Railway. 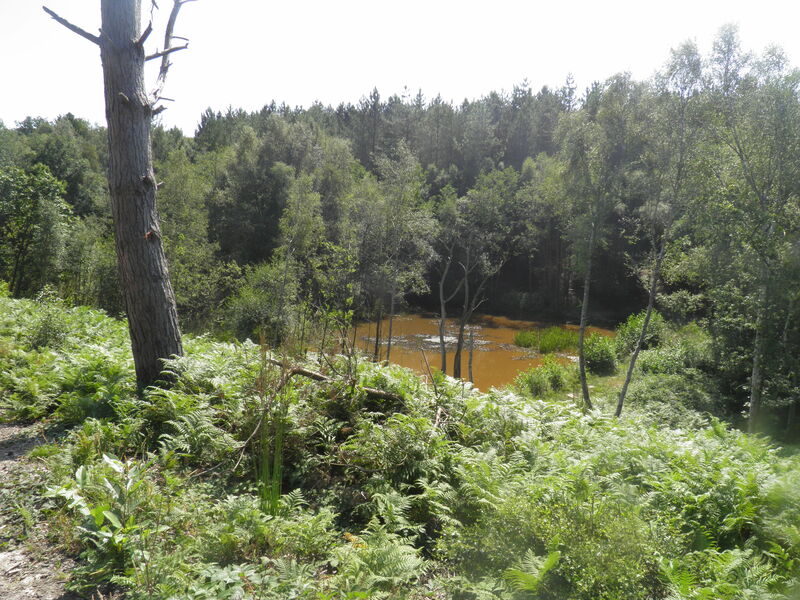 It passes through the nature reserves at Broadwater Warren and Eridge Rocks. 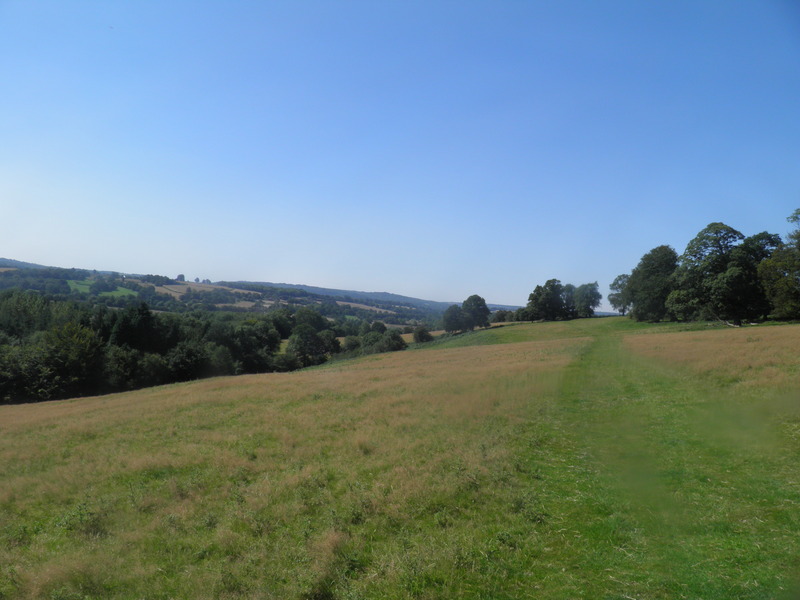 Part of the route uses the High Weald Landscape Trail. Getting home: Southeastern operate a daily hourly service from Frant to London Charing Cross (60 mins) via London Bridge (53 mins) and Waterloo (East) (56 mins). Fares: As start and end points are on completely separate lines, tickets are a little complex. The cheapest combination is to purchase an off-peak day return to Edenbridge stations for £10.30 (£5.15 child, £6.80 railcard) which carries the bulk of both journeys. 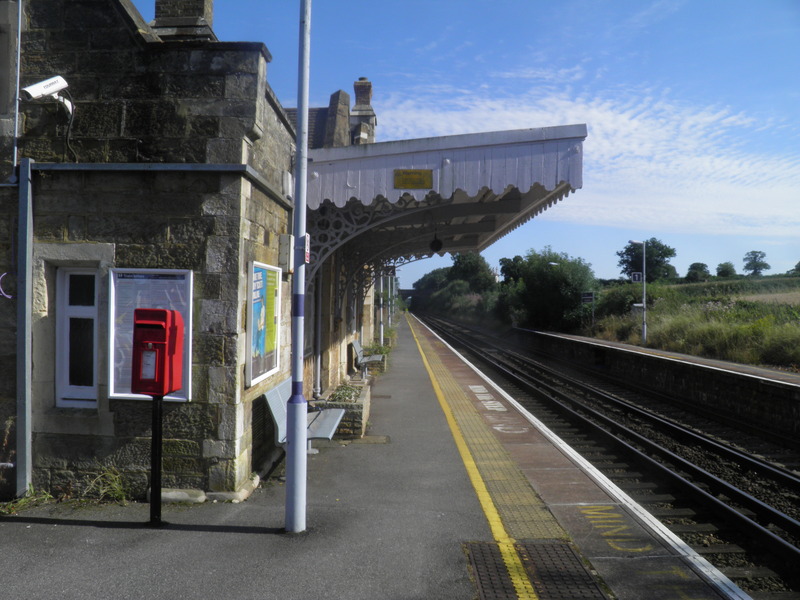 For the outward journey you will also need a single from Edenbridge Town to Ashurst (making sure you book to Ashurst, Kent, not Ashurst New Forest) for £3.60 (£1.80 child, £2.40 railcard), and for the return journey a Frant to Tonbridge single for £4.10 (£2.05 child, £2.70 railcard). Note that Frant does not have a ticket office or machine, so you will not be able to pick up a ticket purchased online there. Tickets can be purchased on the train. At Ashurst station, exit from the Uckfield-bound platform and turn right along the small road leading from the station car park (the ‘private; sign applies to vehicles only. The track climbs steadily before levelling out by the higgeldy Linkhorns house. Beyond Jessup’s Farm, swing left up a track heading straight uphill between banks of bracken. At the track junction at the top of the hill, head right before shortly afterwards veering left beside a gate (no waymark at this point) and continuing to climb along the broad field margin ahead. 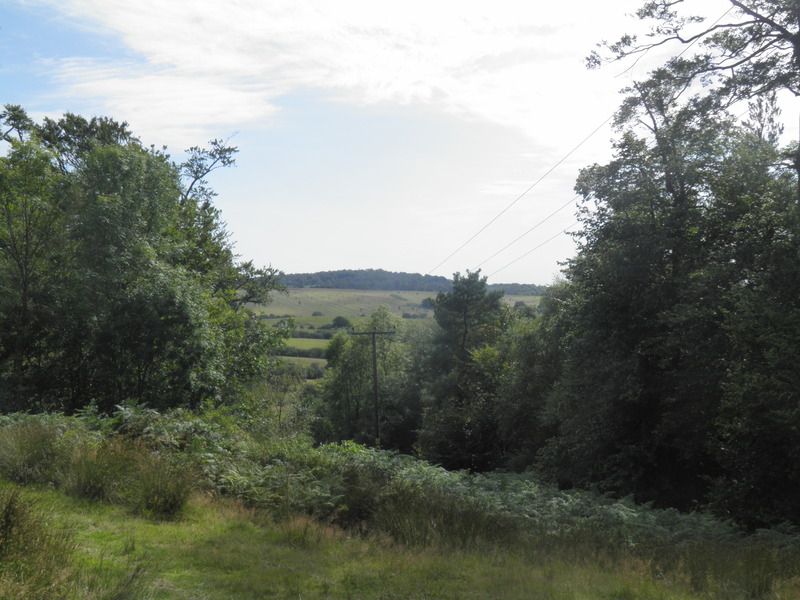 There are fine views as you climb across the Medway valley to the heights of Ashdown Forest beyond. At the end of the field, head right around a bend in the hedge before crossing a stile into a further field, followed by a second, where a broad grassy path leads you along the slope, curving north-eastwards into a side valley. On reaching a gate, do not pass through, but instead turn right to drop to a stile into the woodland below. Descend through the trees and at a path junction head left, soon descending again to cross a tiny stream and to climb out of the valley again. Ignore crossing paths and climb steeply to leave the wood at a gate. Continue straight ahead on the gently climbing track. On reaching the corner of a road, continue straight ahead along it to soon reach another road junction, where you head right. This minor road descends for around 1km, passing occasional large houses. 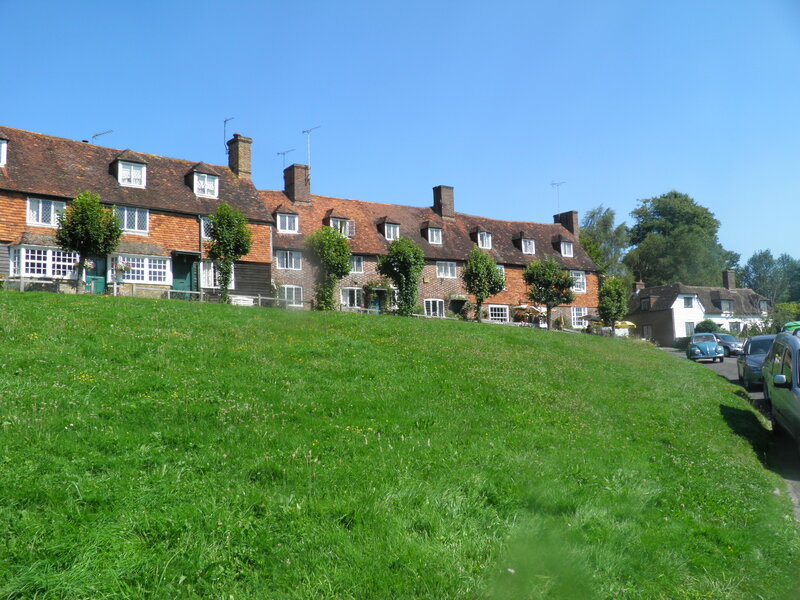 Eventually, you reach the lovely cluster of weather-boarded cottages at the northern end of Groombridge. Take the road heading left across the green to the Crown Inn, cross the main road and take the signed FP opposite, beside the churchyard. The path crosses a field then passes through a kissing gate to pass between Groombridge Place’s fishing lakes and the house itself. Groombridge Place is a fine moated manor house set amongst fine gardens and lakes in the Grom valley. 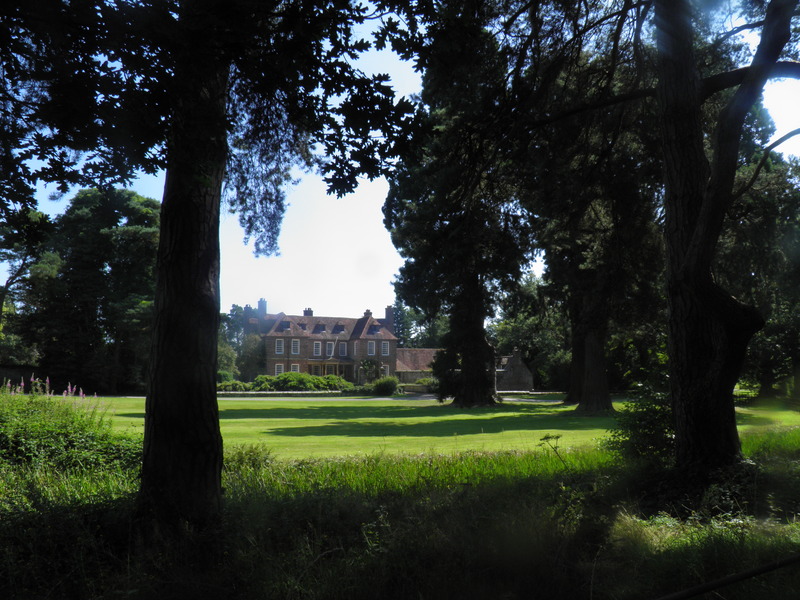 There has been a manor on this site since at least the 13th century, held by a series of aristocratic families – including Sir Robert Weller, who held the Duke of Orleans as prisoner here for many years after capturing him at the Battle of Agincourt. 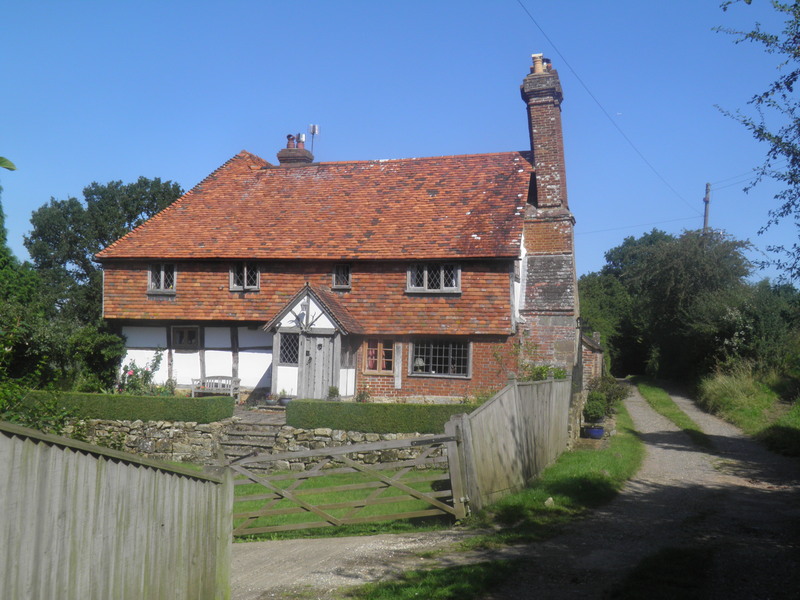 During a period of vacancy at the end of the 17th century, the Place became the centre of operations for the ‘Groombridge Gang’ of smugglers, with rumors of a tunnel between the Place and the cellars of the Crown Inn. The house itself remains closed to the public, but the fine gardens, vineyard and a raptor centre now form tourist attractions. road beside the moat and then straight ahead onto a field path along the lush valley of the Grom. The clear, though occasionally muddy path, picks its way through foxglove patches and through fields, swinging past the oast houses at Pokehill. 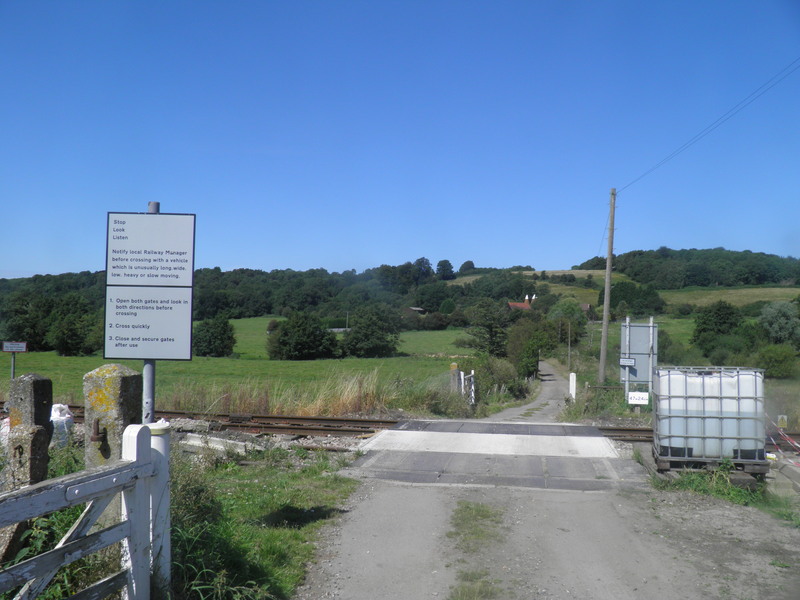 On reaching Pokehill’s track, turn right along it, crossing the river and then a level crossing over the Spa Valley Railway. This railway line was a minor branch line, linking a station at Tunbridge Wells West with the Uckfield line at Eridge. The relatively poor road network in the area meant that this line survived in operation by British Rail until 1985. From 1996 onwards, the line was gradually re-opened as the preserved Spa Valley Railway, operating steam and diesel trains throughout the summer. Full re-opening between Eridge and Tunbridge Wells was achieved in 2011. At a track junction at the top of the rise, head left. Where the track splits just before a modern semi-detached house, keep right on a tarmac drive cutting across fields. This track brings you out at a shady cross roads. Take Lodge Lane straight ahead through the pines of Broadwater Forest. At a road junction, keep straight ahead towards Frant. At the next junction, cross the road and pass through a kissing gate opposite into the RSPB’s Broadwater Warren nature reserve. 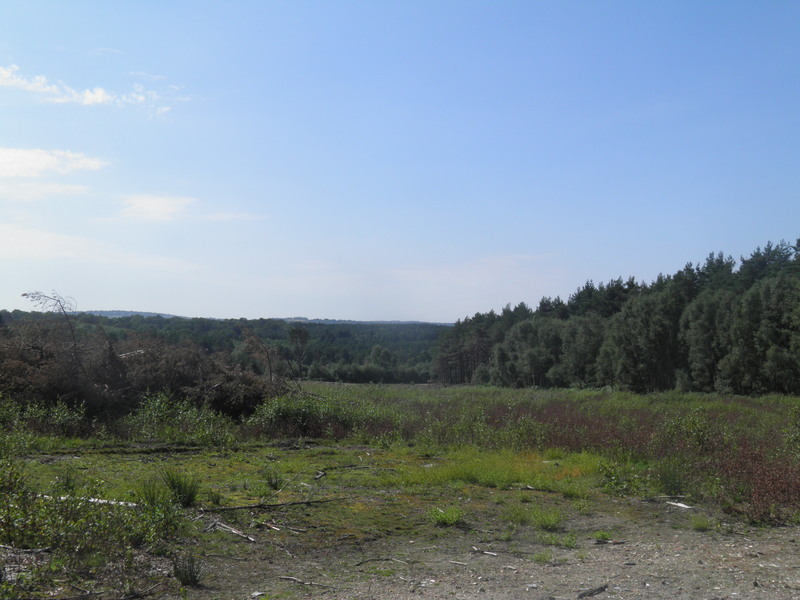 of heathland, and is engaged in a 10-year plan to restore the whole area to its original habitat mix of heath, deciduous trees and woodland. There are already a wide range of bird species who already benefit from the ongoing restoration, including nightjars and woodcock. Continue straight ahead along the clear track, passing through forest and areas being cleared for habitat renewal. Eventually, the track curves down to shallow, iron-stained Decoy Pond, haunt of dragonflies and kingfishers. take the second right, with a white waymark. This track weaves through the woods. Ignore the white waymark pointing right and continue on a clear path straight ahead. Dropping slightly to a path junction in a more open area, just before a telephone line, veer right. Climbing out of the dip, you reach a broader path. Head left, along the base of Eridge Rocks. 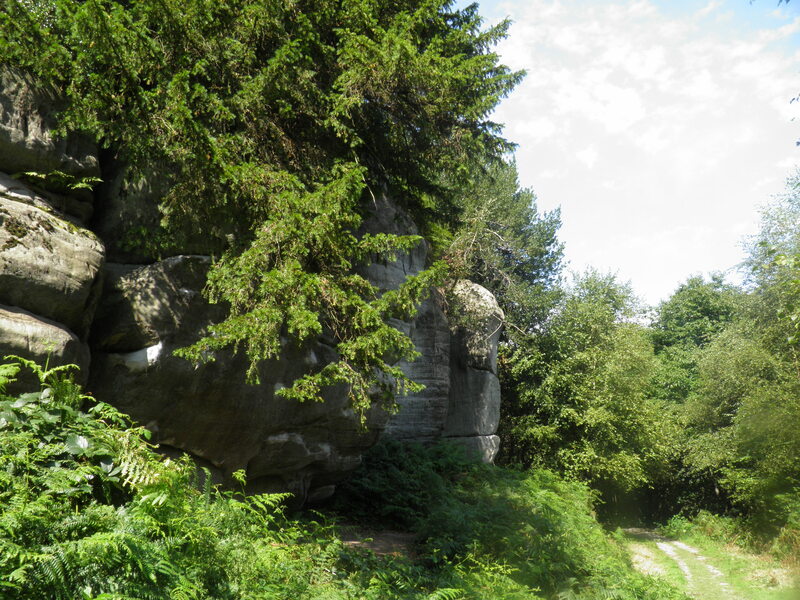 The High Weald landscape provides the only sandstone outcrops in south-east England, with the Eridge Rocks escarpment being one of the largest, including boulders up to 10 metres high. The rocks provide a unique habitat for rare plants, and the area is now designated as an Site of Special Scientific Interest. The path loops along escarpment, eventually emerging at a small car park. Turn left along a little road on the far side of the car park to reach the estate village of Eridge Green. 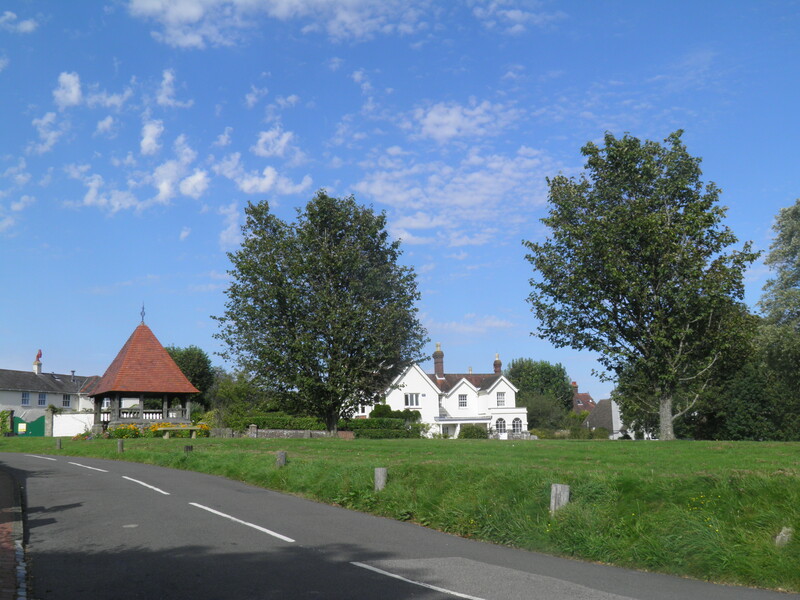 The pleasant Nevill Crest & Gun pub is about 100m left along the main road, past the church. Otherwise turn right past the estate cottages and cross the road by the bus stop on the opposite side of the road, passing through a kissing gate beside the shelter. The well waymarked path meanders across sheep-grazed Eridge Park, paralleling a drive leading to a secluded cottage. Beyond the cottage, the path cross a footbridge over a stream. Keep to the fenced path beyond, crossing a track then wanders through a wood to eventually reach another track. Eridge Park is reputed to be the oldest enclosed deer park in England – at the time of the Doomsday Book it was owned by Odo, William the Conqueror’s brother. 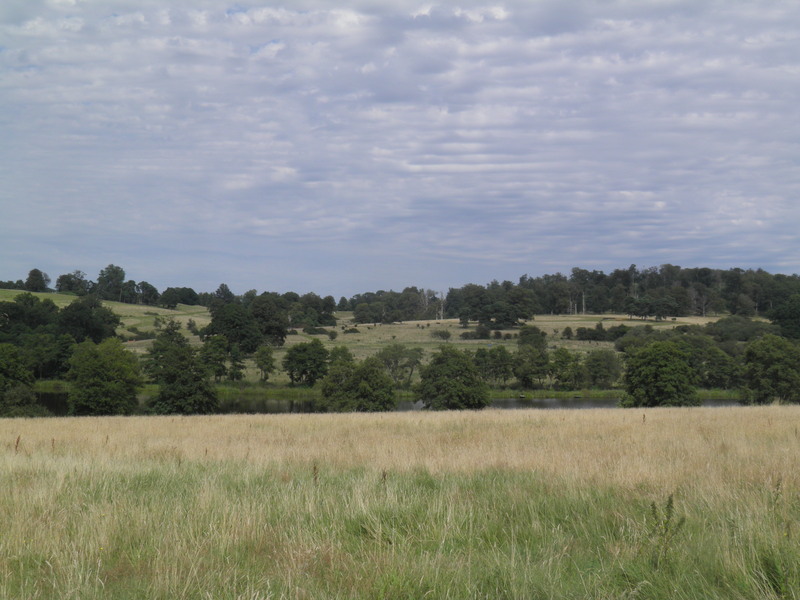 Both Henry VIII and Elizabeth I are known to have hunted here. In the 18th century, Henry Nevill, the Earl of Abergavenny, built an ornate mock castle in the estate, which again attracted a high class of visitors, including Benjamin Disraeli, who came for the venison and strawberries. In the 1930s, the ‘castle’ was demolished and replaced with a Georgian-style mansion house, which survives today. Turn left and keep straight ahead at a junction, on a track crossing an area of open grassland, with views over a rather beautiful fishing lake below, which would originally have been a pond to provide power for the 16th century iron industry. Dropping to cross a small stream, you leave the track and head left on a narrow wamarked path along the edge of woodland. 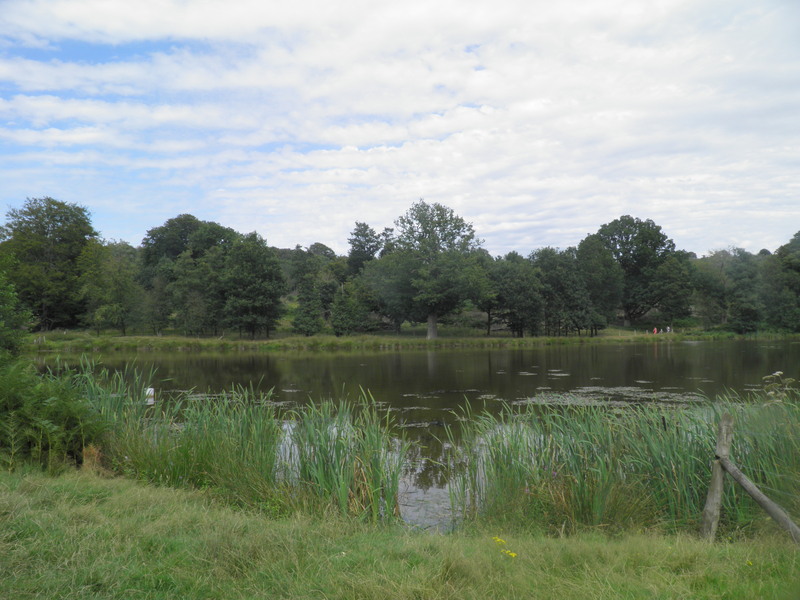 A metal footgate brings you out beside a smaller, rush-lined fishing lake. Turn left along its edge, then after a footbridge, head right along a track along the north bank. Beyond the lake, the track runs along the top of a wood, eventually crossing a climbing track and then dropping to re-cross the stream. Just beyond the stream, before a gate, the path turns left off the track and again along the edge of woodland. A little way along, you come to a post with maps showing permissive paths through Eridge Old Park. Turn left at this post, across the small stream and then follow a faint path uphill through the sparse woodland. Across a wide stretch of open land, covered in bracken, you reach a faint track, with permissive path waymarks. Follow these right, downhill. Eventually, you cross a stream and climb steeply beside a fence. At the top, by another map, turn left through a large metal foot gate. This path soon brings you out on the main road through Frant, almost opposite the Abergavenny Arms. Cross and turn left past the pub, then as you enter the village turn left by the post office, up the side of a huge village green. At the top of the green, keep straight ahead on road signed to Bells Yew Green and the station. 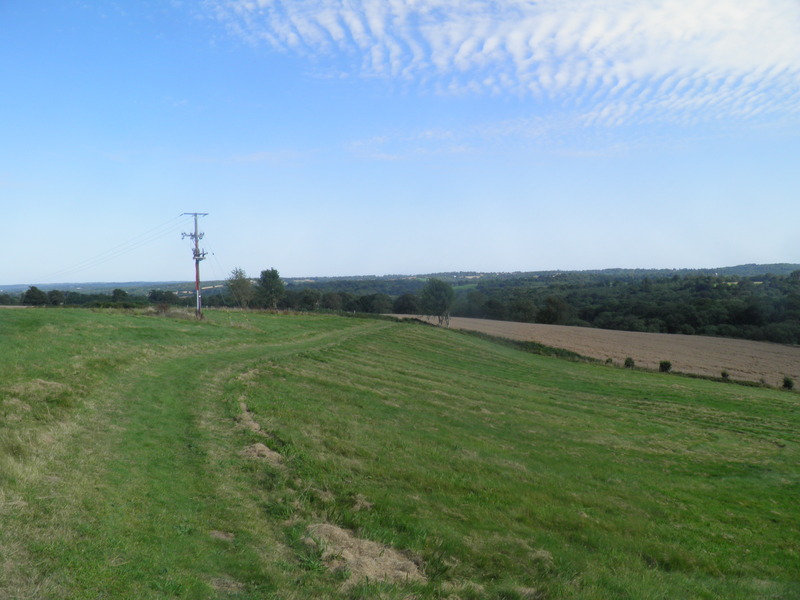 Just past the last house, head right over a stile by a gate and head left on the faint track across grassy fields, with huge views south across the Weald. After following the clear path across a number of fields, you cross a stile to reach a small tarmac drive. Turn left, climbing gently, to return to the Bells Yew Green road. Turn right, past Brynderi Cottage. Shortly afterwards, turn left on a well hidden, signed footpath. A couple more stiles leads you to a small industrial estate. Take the track straight ahead beside a large green building and pass through the gate at the end. A small track descends through fields, with fine views over the valley ahead. Past a cottage, the track becomes more overgrown, but soon brings you out onto the B2169. Turn right, under the railway bridge. The entrance to Frant station is about 200m on on the right. Trains to London depart from the platform over the footbridge. This is such a beautiful walk, highly recommend it! 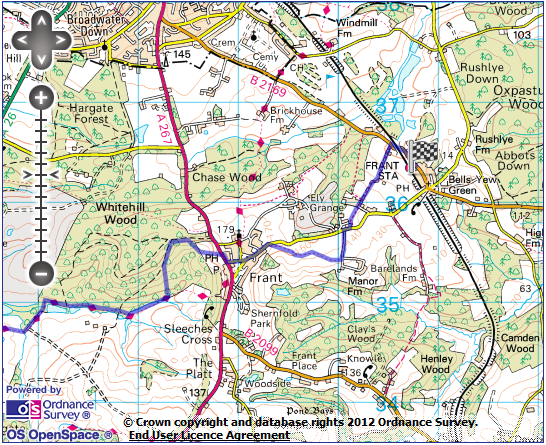 I did this walk last sunday, incredibly beautiful and diversity of landscape. We continued walking along the fence and found another exit about roughly 500m? 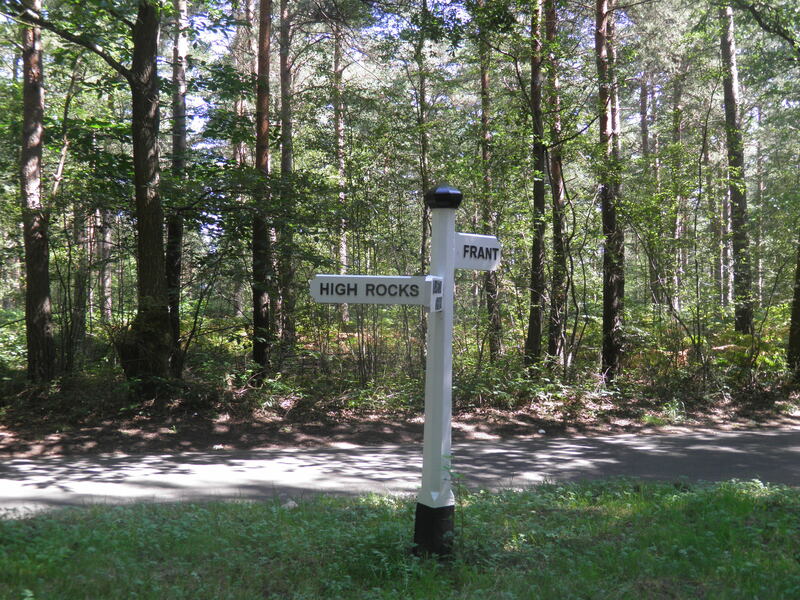 further, which brings you out to the main road leading to Frant. From there you can pick up the route again. Otherwise all great , we even managed to get a direct line to London Bridge from Bells Yew Green! Thanks for the message and glad you enjoyed the walk. Thanks for the feedback – I will try and get out there at some point soon and update the description.